Free Skates live up to their name. They are the epitome of freedom. The urban skates renounce dogmas, reservations, and limitations. Do you want to cruise comfortably along slippery roads, make a quiet round around your house lake, roll relaxed through the city - and at the same time, jump over stairs, pull wide airs on the ramps in your skate park, and shuffle over the street spots? Then free skates are right for you. 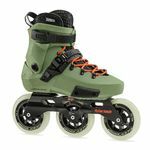 This new form of urban skates combines the soft ride of fitness skates with the robustness of stunt skates. 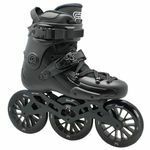 With a stable boot, a shorter blade and not too big rollers, these skates maintain maneuverability and comfort, have but at the same time also have sufficient support and resistance for aggressive skating. Free skates are the modern all-rounder of inline skating. They embody the ideal compromise and allow you to perform stunts and cruise with the same pair underfoot. And you can get all this in our shop! We at Grindhouse offer you the latest models of free skates from Seba and Rollerblade, Roces, Powerslide, and Doop. Find your ideal skate with us - whether for yourself or as a gift for one of your loved ones. And the best part: with Grindhouse, you can shop from the comfort of your home. Our store delivers your shoe or your gift right to your door.